In the case of QBE North America, a subsidiary of Australia’s QBE Group, the company is moving into the management liability and professional lines (MLPL) space as part of its shift towards becoming a more specialized commercial insurer. QBE Group is ranked among the top 20 of the world’s largest P&C insurers. In 2013, QBE had gross written premium of $18 billion and 16,000-plus employees spread across 43 countries. When QBE launched its North American operations in 1991, the focus was on quickly building an operation that will support clients for decades to come. That philosophy still drives QBE North America today. QBE North America’s management liability & professional lines group is a prime example of how marshalling the resources to meet a tremendous opportunity are fueling rapid and robust growth. Having entered the MLPL market less than a year ago, the group is already poised to have a significant impact on the professional liability space. Kearns breaks down the success factors of the MLPL group into three key areas — commitment, clarity and experience. While QBE North America’s MLPL business will offer excess coverage, the best measure of the company’s market commitment is its plan to offer a full range of primary coverages, including commercial errors and omissions and directors’ and officers’ liability for all types of customers — from public to private companies and not-for-profits to financial institutions. By July, when QBE completes its rollout, it will represent the quickest route ever to being a primary MLPL insurance provider in the North American market. From the start, that will mean the number of true competitors will be significantly reduced, because while there are plenty of excess markets, a select few provide primary coverage, and even fewer provide truly innovative products backed by global scale. Clarity and simplicity are not often used to describe the commercial insurance industry. To that end, QBE intends to shake things up with contract language and forms that focus on exactly those attributes. For example, QBE retooled its excess form from two pages to a half page. For more complex primary coverages, it took 30-page forms and reduced them to less than 10. 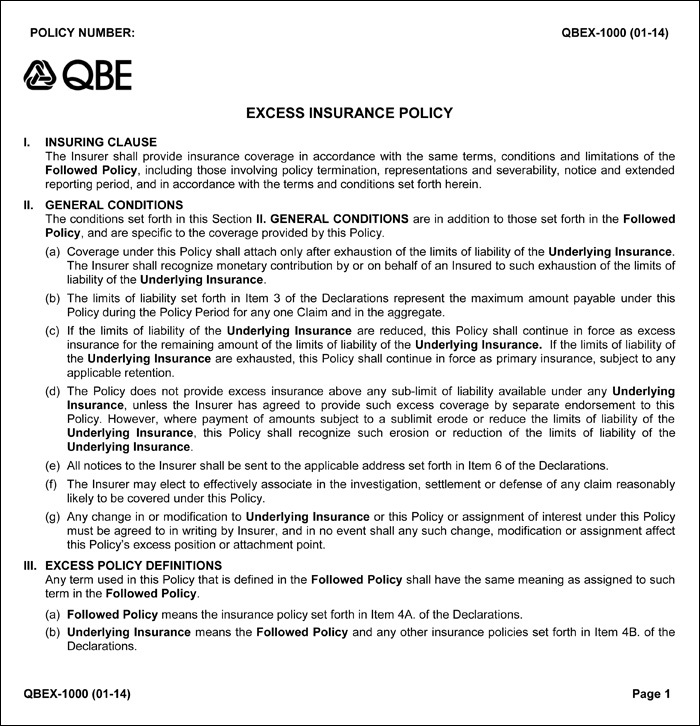 This is the entire length of QBE’s excess insurance form (short version). When it comes to its policy simplicity and clarity, QBE believes it is unique. Best of all, those two features will be consistent in all QBE contracts — all will look similar down to the construction of insuring clauses, creating an immediate comfort level with both buyers and brokers. QBE’s clarity and consistency are powerful differentiators that set it apart from other insurers. The QBE professionals working in claims and underwriting include some of the most talented executives in the industry. The company’s focus is not only on hiring the best but also in creating large teams that can support the growth objectives for the long-term. For example, the MLPL underwriting team already is staffed by 20 top professionals with several hundred years of cumulative experience in the liability business throughout North America and abroad. On the claims side, QBE focuses on a business-driven approach that reduces the tendency for “over-lawyering” that can cause problems in delivering swift, fair claim responses. Jeff joined QBE North America in 2013 to lead the development of its Specialty Business Group. In this role Jeff reports to David Duclos, Chief Executive Officer. Jeff also serves as Chairman of the North American Underwriting Committee. Jeff has more than 25 years of insurance experience and previously served as the Chairman of the Group Underwriting Committee and Global Practice Leader for Management Liability & Professional Lines at Torus Insurance. He spent more than 21 years with the Chubb Group of Insurance Companies where he was a Senior Vice President and worldwide manager for their professional liability businesses. Craig joined QBE North America in October 2013 to lead the Private Company effort within Management Liability & Professional Lines. Craig has 20 years of insurance experience in underwriting. Craig joined QBE from Torus Insurance where he led the Private Company Management Liability team. Previously, he was an Executive Underwriter for the Chubb Group of Insurance Companies and held various underwriting and producer management roles. Craig earned a B.A. in Political Science from Assumption College. Mike joined QBE in October 2013 to develop and build out QBE’s commercial E&O products in the U.S. Mike has more than 24 years of underwriting experience in various lines of professional liability. He joins QBE from Torus where he was responsible for commercial E&O products in the U.S. Prior to Torus, Mike worked at Chubb, where he was the Worldwide MPL Product Manager responsible for setting the specific underwriting guidelines, as well as overseeing the growth and profitability of the worldwide book since 2004. Mike earned a B.A. from the University of Maryland and an M.B.A from George Washington University. Sharon joined QBE North America from Torus Insurance to lead the Financial Institutions effort within Management Liability & Professional Lines. Sharon has more than 25 years of Insurance experience in both underwriting and brokerage, and is a leading expert in Directors & Officers Liability, Professional Liability, Employment Practices Liability, Fiduciary Liability and FI Bond. Sharon is a graduate of Yale University, where she received a B.A. in Economics. Dennis is responsible for all management liability and professional lines products across the Public Company, Private Company, Financial Institution, Commercial E&O and Healthcare segments. Prior to joining QBE, Dennis was a Managing Director and Manager of the Claims Advocacy Group for Marsh FINPRO specializing in complex coverage and claims issues. Before joining Marsh, Dennis worked for Chubb including senior attorney for the specialty lines business unit. Dennis earned a J.D. from Seton Hall University School of Law and a B.S. in Marketing from Saint Peter’s College. John joined QBE North America to lead the Public Company segment within the Management Liability lines. John joined QBE from Chubb Specialty Insurance where he managed public and financial institution specialty business as Vice President and Northern Regional Manager. In previous roles at Chubb, John managed specialty for the UK & Ireland Region and the company’s worldwide portfolio of asset management- related products. John holds a B.S. degree in Finance from Western Michigan University. This article was produced by the R&I Brand Studio, a unit of the advertising department of Risk & Insurance, in collaboration with QBE North America. The editorial staff of Risk & Insurance had no role in its preparation. QBE North America is a division of QBE Insurance Group Limited, one of the world's 20 largest insurance and reinsurance companies. We offer the unique integration of financial strength, a broad product set and sophisticated capabilities to deliver value for our partners and policyholders. Skip Smith, of Hooters of America, can point to numerous mentors who aided him. Workers' comp fraud has been on the rise in California ever since probation officers were included under the state's vexing labor law. Pharmaceuticals can do as much harm as good. Payers can help keep treatments in check.